In this children’s craft project, you will learn how to make a little pipsqueak monkey, with bendable arms and legs, from simple materials such as pompoms and chenille stems. To make the legs, take one six-inch chenille stem and bend it in half. Now bend a short tab on each end to form the monkey’s feet. To make the arms, take another six-inch length of chenille stem and bend small tabs on each end to make the monkey’s hands. Take the last piece of chenille stem and curl the end around your finger, or around a pencil, to make the end of the tail. Attach the arms to the legs by twisting the stems together at the centre points, as seen in the diagram shown at left. Attach the tail by bending a little bit of the uncurled end around the centre point of the arms and legs. Put a generous amount of tacky glue in the centre of the arms, legs and tail. Make sure the glue is applied to both sides. Now sandwich the two larger pompoms together around this spot of glue, placing one at the front of the monkey, and the other at the back. Press the pompoms together firmly until the glue begins to hold. Cut a piece of beige felt into a peanut shape, or a figure eight, to fit on the small pompom. Glue two plastic, movable eyes to the top of the face. Draw two small, vertical lines for the nose using the black, fine-tipped marker. Draw a small horizontal line for the mouth. Apply glue to the back of the felt face then press onto the small pompom. Apply glue to the top of the monkey’s pompom body, between the two arms. Press the head into the glue, holding it in place until the glue begins to stick. Finally, allow the glue to dry, then find a good place to put your monkey. 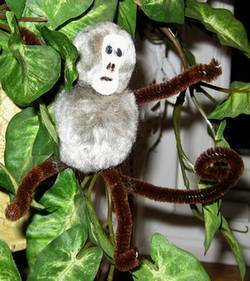 By bending the hands or feet, or even the tail, you can hang the monkey in the tendrils of house plant, or in other surprising places.